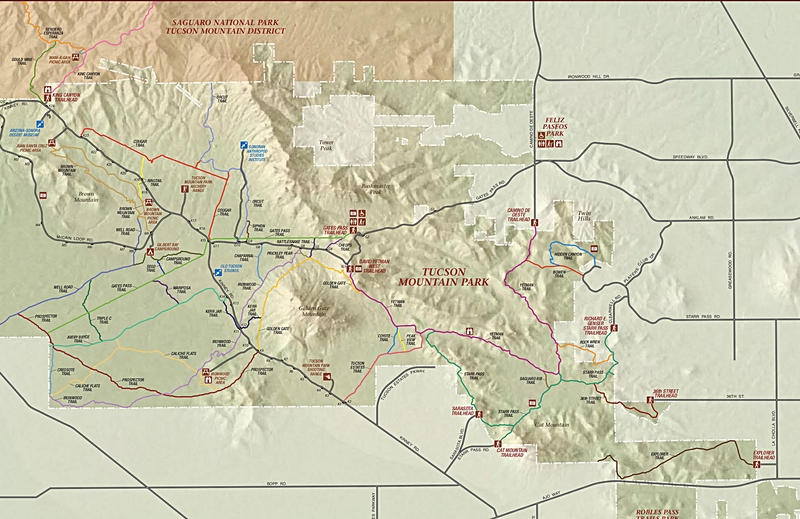 Here is a nice multiloop that can be done in the Tucson mountains. It also includes a short off-trail scramble to bag the twin-topped Peak 4236 just south of Wasson Peak. There are also some petroglyphs along the way. Take off from the Kings Canyon trailhead, well known here in Tucson. Head along and through the gate marking the Park boundary. Travel along the old road heading towards the mountains at a gradual elevation gain. In about 0.9 miles the trail breaks off to the left towards the Mam-A-Gah picnic area. Continue straight up the wash here. The wash is wide and sandy. It climbs gradually. Shortly, you will see where the Kings Canyon trail crosses over the wash, with a small trail sign in the wash. Here head right and go further up the wash and away from the trail, which quickly climbs back up the ridge to your left. Keep climbing up the wash of Kings Canyon and in a total of about 1.3 miles from the trailhead an informal, unmarked trail climbs out of the wash to your right. Take this trail out of the wash and head up into the mountains. This old trail is not marked, named or noted on the park maps but it is nice and easy to follow nontheless. If you've been near the Sweetwater saddle in the Tucson Mountains, no doubt you have seen it sweeping out south. This is a nice gradual climb up the mountain south of Wasson. It curves around and ultimately dumps you out at the Sweetwater Saddle at about a total of 3 miles from the trailhead. From the saddle, go off route and scramble up the south ridge to your left. There is no trail but it is easy to see where you want to go. Make your way around (or through if you are me) the various patches of prickly pear and shindaggers out to get you. Please be kind and don't step on the little saguaro and hedgehogs here and there, though. The more near summit is the higher of the two topping the bidomed mountain. It is the true peak 4236 and you reach it in about 0.3-0.4 miles. There is a small cairn and summit log on top. I was the first to sign it in over a year. From there you can see the other summit across a small saddle. Bushwack you're way over to this one (about 4204 or so) and take in the nice views of Gates Pass. This is less than 0.2 miles from the first peak. I said "hello" to the deer up on the saddle, then made my way back to the Sweetwater saddle. From the saddle head down the marked and well-maintaned Kings Canyon trail. The sign at the saddle indicates the trail by noting it's the route to the Mam-A-Gah picnic area. Criuse down this well known trail and bottom out in the wash where you started. You can take the wash all the way down, instead of hooking back up with the Kings Canyon trail. I took the wash to the end. There are some petroglyphs up to your right about half way down the wash to look for. A small trail breaks left out of the wash just before the main road and takes you up to the parking lot. Have fun and enjoy this loop out to a seldom visited summit next to the famous Wasson Peak. In Tucson from I-10 take Speedway west. This turns into Gates Pass Road. 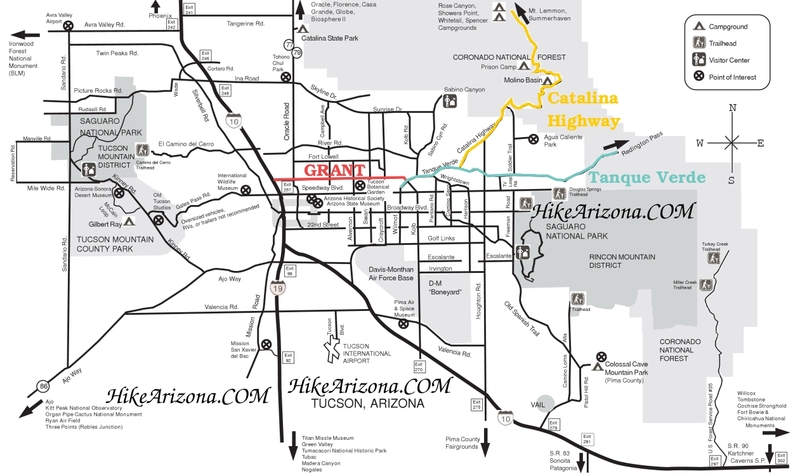 Turn right on Kinney Road and head past the Arizona-Sonora Desert Museum. The trailhead is located a short distance north of the museum. Parking is off on the right.